Chanteur Country US né Hebert Clayton Penny, le 18 Septembre 1918 à Birmingham (Alabama). Hank Penny a débuté au milieu des années trente. 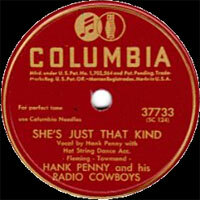 En 1936, Hank fonde les "Radio Cowboys" et enregistre son premier disque en 1938 chez Columbia. Puis il passe chez King (45-50), RCA (50-52) et Decca (54-57). Hank est devenu comédien. Il est décédé le 17 Avril 1992. 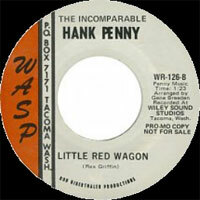 While he never achieved the kind of success enjoyed by fellow bandleaders like Bob Wills or Spade Cooley, during the late '40s and early '50s Hank Penny ranked as one of the foremost practitioners of the Western swing sound. Born Herbert Clayton Penny on September 18, 1918, in Birmingham, AL, his father was a disabled coal miner who inspired young Hank with his skills as a guitarist, poet, and magician before his death in 1928. By the age of 15, Penny was performing professionally on local radio; in 1936, he moved to New Orleans, where he first fell under the sway of Western swing pioneers like Wills and Milton Brown. A friendship with steel virtuoso Noel Boggs only served to further his enthusiasm for the swing form. After a few years with New Orleans' WWL as a solo performer, Penny returned to Birmingham, where he formed the group the Radio Cowboys, which featured guitarist Julian Akins, steel guitarist Sammy Forsmark, tenor banjo player Louis Damont, bassist Carl Stewart, and vocalist, guitarist, and fiddler Sheldon Bennett. 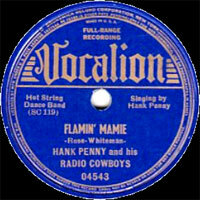 In 1938, the group (minus Akins) first entered the studio under the guidance of legendary producer Art Satherly to record numbers like "When I Take My Sugar to Tea" and Penny's own "Flamin' Mamie." After the Radio Cowboys joined the cast of the Atlanta-based program Crossroad Follies, Forsmark left the group, to be replaced by Noel Boggs; at the same time, they also welcomed a new fiddle player by the name of Boudleaux Bryant. 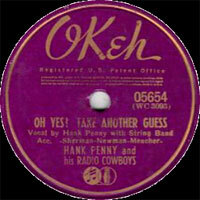 After turning down offers to take over vocal chores for both Pee Wee King's Golden West Cowboys and the Light Crust Doughboys, Penny moved the group to Nashville in 1939, where they again recorded with Satherley. Shortly after, Boggs left the group to join Jimmy Wakely and was replaced by Eddie Duncan. After recording songs like "Tobacco State Swing" and "Peach Tree Shuffle" in Chicago in mid-1940, the band was forced to dissolve after most of its members were drafted. 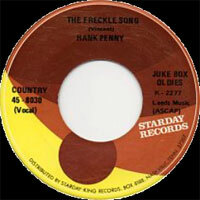 Penny remained in Chicago working as a disc jockey before assembling a new group for a 1941 session in North Carolina, which generated the songs "Why Did I Cry" and "Lonesome Train Blues." After signing on with the Cincinnati station WLW's programs Boone Country Jamboree and the Midwestern Hayride, Penny formed a new band called the Plantation Boys, which included Radio Cowboy Carl Stewart on fiddle along with guitarist/bassist Louis Innis, fiddler Zed Tennis, and lead guitarist Roy Langham. In addition to work with the Delmore Brothers, Merle Travis, Bradley Kincaid, and Grandpa Jones, they also backed WLW's pop singer Doris Day. 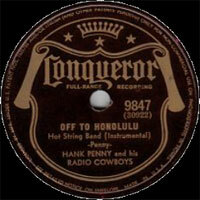 After the departure of Langham, in 1944 the band toured with the USO before Penny traveled to California at the urging of Travis. There, he became enamored with the music of Spade Cooley and met Cooley's onetime manager Foreman Phillips, who offered Penny work as a bandleader. 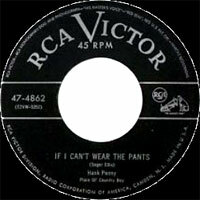 After a brief return to Cincinnati which led to a brief recording date, Penny returned to California to assemble another band which included Boggs; however, when Phillips began ordering Penny how to play, the bandleader balked and the group promptly disbanded. Soon, he was fronting an all-girl band at a Los Angeles club but was quickly approached by Bobbie Bennett, Cooley's then-manager, to lead one of several groups formed to play at the bookings Cooley and his orchestra were themselves too busy to fulfill. While Tex Ritter led one band and Travis led another, Penny fronted the Painted Post Rangers, which scored a pair of significant chart hits with "Steel Guitar Stomp" and "Get Yourself a Redhead." When the Painted Post Club went bankrupt, he moved to lead the large house band at the Riverside Rancho. In 1946, he joined Slim Duncan's ABC network show Roundup Time as a comedian. After moving first back to Cincinnati and then to Arlington, VA, he returned to California and took a disc jockey position. 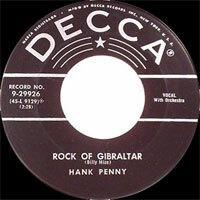 He also formed yet another new band, the Penny Serenaders, which included guitarist Speedy West as well as accordion player Bud Sievert, fiddler Billy Hill, and bassist Hank Caldwell. Together with club owner Amand Gautier, Penny also opened his own dancehall, which featured Bob Wills on its opening night. In June 1948, Penny joined Cooley's massively popular television program, where he performed as a comedian best known for his backwoods character "That Plain Ol' Country Boy." A year later, he entered the studio to record a number of songs, among them "Hillbilly Bebop," the first known bop effort cut by a country act, and the 1950 hit "Bloodshot Eyes." After he and Gautier opened another club, the legendary Palomino, he reformed the Penny Serenaders, which included singer Mary Morgan, later known as Jaye P. Morgan. The group issued "Remington Ride" and "Wham Bam! Thank You, Ma'am" before calling it quits and then reforming again, this time with guitarist Billy Strange and steel guitar whiz Joaquin Murphy. 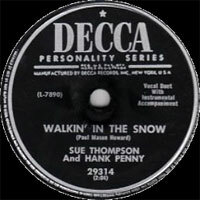 In 1952, Penny left Cooley to join Dude Martin's program; after first stealing Martin's wife, singer Sue Thompson, he began hosting his own series, The Hank Penny Show, which was canceled after only seven weeks. 02/1939 78 t. VOCALION VO 04640 (US) . 02/1940 78 t. CONQUEROR 9332 (US) . 08/1940 78 t. CONQUEROR 9391 (US) . 08/1940 78 t. CONQUEROR 9392 (US) . 05/1941 78 t. CONQUEROR 9708 (US) . 05/1941 78 t. CONQUEROR 9709 (US) . 05/1941 78 t. CONQUEROR 9710 (US) . 11/1941 78 t. CONQUEROR 9844 (US) . 11/1941 78 t. CONQUEROR 9845 (US) . 11/1941 78 t. CONQUEROR 9846 (US) . 11/1941 78 t. CONQUEROR 9847 (US) . 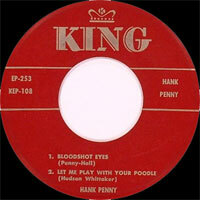 1947 78 t. KING 606 (US) . 07/1947 78 t. COLUMBIA 37666 (US) . 07/1947 78 t. COLUMBIA 37733 (US) . 08/1947 78 t. COLUMBIA 37740 (US) . 08/1947 78 t. COLUMBIA 37750 (US) . 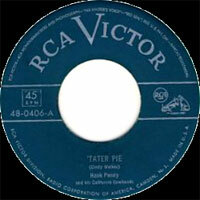 04/1948 78 t. COLUMBIA 20310 / 37733 (US) . 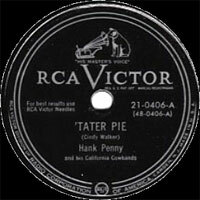 04/1948 78 t. COLUMBIA 20317 / 37740 (US) . 04/1998 78 t. COLUMBIA 20327 / 37750 (US) . 01/1950 78 t. KING 828 (US) . 10/1950 SP KING 45-891 (US) . 06/1951 78 t. KING 941 (US) . 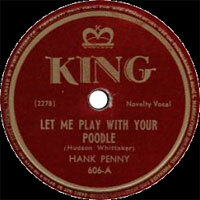 12/1951 78 t. KING 1020 (US) . 08/1955 SP KING 45-1500 (US) . 1969 SP WASP WR 117 (US) . 06/1970 SP WASP WR 126 (US) . 1973 SP STARDAY 45-8030 (US) .